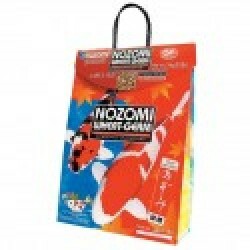 Nozomi wheat-germ is a high quality feed based on well assimilated wheat-germ and first grade fish meal, formulating necessary nutrients to meet the exact dietary requirements of Koi. 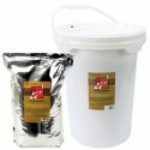 Wheat-germ is a natural source of vitamin E, an important vitamin to promote healthy growth and great Koi color. Formulated ascorbyl-2-phospate (stabilized vitamin C), chitin (chitosan), garlic and brewers dried yeast aid to enhance your Koi’s liver function and immunity against various types of diseases. Wheat-germ is a floating type feed which does not cloud water, thus lessening water pollution. 5°C (40°F) or below: feeding unnecessary as fish will normally not eat. 5°C (40°F) – 10°C (50°F): feed once daily in the morning. Do not exceed the amount fish will eat within ten to thirty minutes. 38% MIN. 3% MIN. 6% MAX. 10% MAX. 15% MAX. Ingredients: white fish meal, krill meal, wheat flour, wheat-germ meal, soya bean meal, alfalfa meal, brewers dried yeast, garlic, ox bile, calcium phosphate, bakery yeast extract, chitin (chitosan), ascorbyl-2-phosphate, vitamins, minerals.